Wear your presence on Richard Nixon's enemies list as a badge of honor. With Robert Gibbs as the latest in a long line of White House sources from every single Administration to bemoan leaks—most recently to Wikileaks, about the conduct of the war in Afghanistan—Daniel Ellsberg seems more and more like the patron saint of our time. 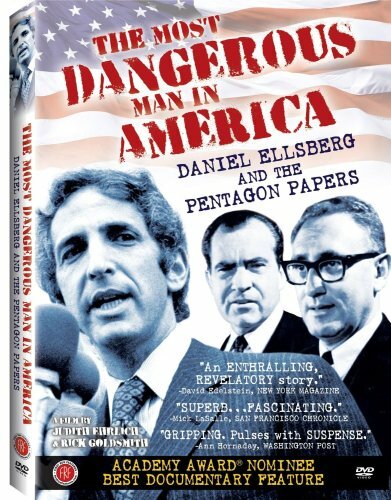 This documentary is frankly partial to him, and that's a good thing; it pungently re-creates Ellsberg's historical moment, and one can't help but draw comparisons to wars conducted far away and on fraudulent pretexts in our own time. What's especially striking, as Ellsberg and the filmmakers tell his story, is how it has all the classic trappings of a religious conversion or epiphany. We see him as a younger man, a combat veteran and a quick study, working for the Department of Defense during the Johnson years—he's one of the foremost proponents of the war in Vietnam, and he sets about cherrypicking the intelligence from the field to justify in the public imagination (and to Congress) the President's desire to ratchet up the combat. (He's completely getting his David Addington on, and it's kind of terrifying.) The film uses recent interview footage and voice-over from Ellsberg, and cobbles together what it can from the archives—there are a couple of missteps, I think, with an actor used to re-create some scenes, and even a couple of brief forays into animation. (!) But you can understand why directors Judith Ehrlich and Rick Goldsmith thought this was necessary—you're just not going to find a lot of stock footage of guys xeroxing and smuggling out thousands of pages of documents. Ellsberg's second wife, Patricia, functions almost as his conscience—she was an ardent anti-war activist, and their courtship has a politically informed Mad Men sort of air to it, with copious cocktails and handing out leaflets. Ellsberg goes to work for the RAND Corporation, in Santa Monica, and revels in his insider's knowledge; but when he sees the carnage of the war in Vietnam, he decides it's time for the battle to be joined. It's also a chance to revisit or to discover some of the notable characters of the period: Mike Gravel when he was a swashbuckling Senator, and not just a cranky fringe Presidential candidate; John Dean, on his journey from White House weasel to eminence grise; Neil Sheehan, recipient of the papers, a Times reporter before writing maybe the best book ever about Vietnam (A Bright Shining Lie). And this is what makes the small package of extras kind of inexplicable—the two featurettes are interviews with actor Woody Harrelson, and writer Naomi Wolf. They both speak to Ellsberg's bravery—Harrelson calls him a hero, and Wolf contrasts his behavior to the ostrich-like denial around torture at Guantanamo Bay—but there's nothing here that's first hand. There are also excerpts from Nixon White House tapes (including some of the greatest hits, like Dean's "cancer on the presidency" aria), links to Ellsberg's blog, brief filmmaker bios, and trailers for four other First Run DVD releases.